I was first introduced to scrumbling in 2003, by the ever-so intriguing, Prudence Mapstone. Immediately, I realized crochet needed to become part of my repertoire of stitches. Further investigation uncovered The Crochet Workbook by Sylvia Cosh and James Walters, well-known crochet designers opened my worldview to Freeform. From NSW, Australia, Jenny Dowde also explores color, texture and freeform with her scrumbling, Freeform Knitting and Crochet along with FREEformations include many projects, I look forward to exploring. Scrumbling/freeform swatches provide an opportunity for experimentation with different color and stitch combinations. 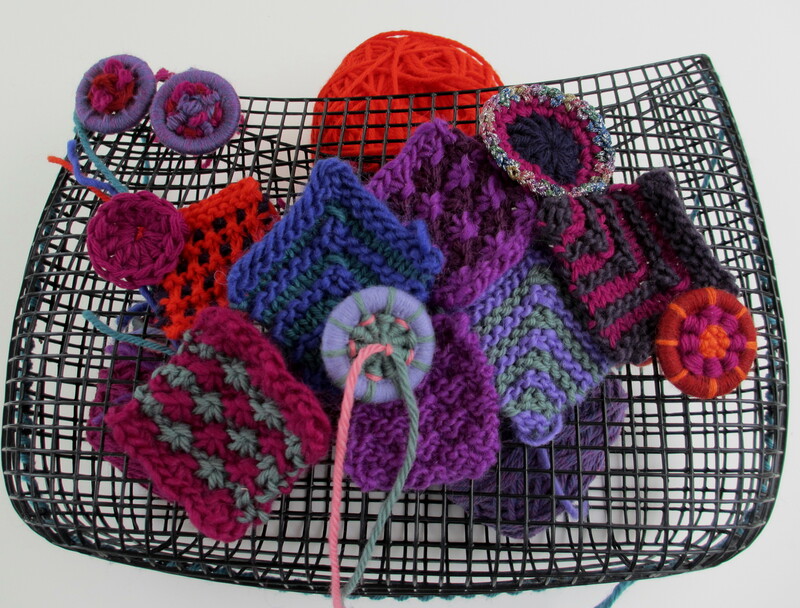 The “no rules” policy of freeform liberates the fiber artist from the “usual” to the “spontaneous.” Combining the culture of knitting and crochet exposes an abundance of shape and texture. I’ve also added dorset buttons to the mix…the purse form from Japan may be purchased at Lacis Museum and Textiles http://www.lacismuseum.org/ in Berkeley, CA. Crochet popcorns and bullion stitch are my next stitch challenges. I’m digging through my stash for different textures of yarn for a variety of visual interest.